As noted earlier, many IRE journalists perceive issues of digital security — particularly stemming from government surveillance programs — as a serious concern mainly for journalists who cover national security, foreign affairs or the federal government. Survey data confirm this perception to some degree, with journalists working in these sensitive national and international areas expressing more concern about their digital security and making more behavioral changes in response to recent events than other journalists. Throughout this section of the report, this group is referred to as “national government/foreign affairs” journalists. Of the 671 survey participants, 164 are journalists who focus on national security, foreign affairs and/or the federal government. Among this group, 71% believe the government has collected data about their phone calls, emails and other online communications. That is higher than the 62% of IRE journalists covering other topics who believe their data has been collected as part of government surveillance programs. These national government/foreign affairs journalists are also more likely than others to have changed their behaviors in the past year with regard to how they store potentially sensitive documents and how they communicate with colleagues. They are also more likely to have spent time in the past year researching digital security, and are more likely to be adopters of a wide variety of security enhancement tools. 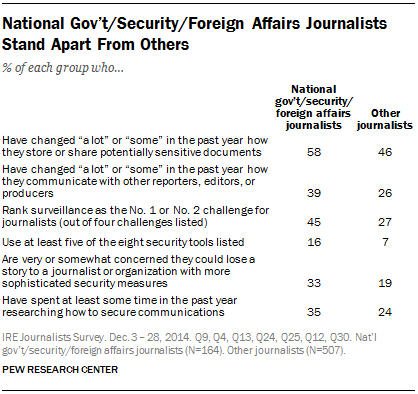 More than four-in-ten national government/foreign affairs journalists rank surveillance as the Number one or number two challenge for their profession among four different challenges asked about. And one-third worry about losing a story to a competitor with more advanced digital security protocols in place. In both cases, fewer investigative journalists who deal with other topics express these concerns. 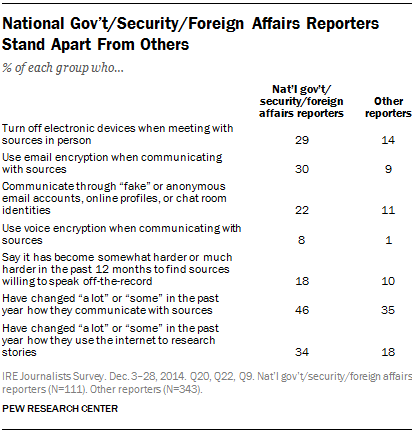 And among the national government/foreign affairs journalists who work for a news organization, 58% tend to feel their organizations are not doing enough to protect journalists and their sources from surveillance and hacking, compared with 48% among other investigative journalists who work for a news organization. Of the 164 national government/foreign affairs journalists surveyed, 111 identify themselves specifically as reporters. This group was asked a range of questions that pertain especially to their circumstances. This group is more likely than other IRE reporters to employ the following measures to protect their sources’ identities: turning off electronic devices when meeting sources in person, using email encryption, using phone encryption, and communicating with sources through “fake” or anonymous email accounts, online profiles or chat room identities. At the same time, they are more likely than other reporters (18% vs. 10%) to say it has gotten harder in the past 12 months to find sources willing to speak off the record. Looking back over the past year, these reporters are also more likely than other investigative reporters surveyed to have changed the way they communicate with sources and in how they use the internet to research stories.